SUPIMA COTTON POLO SHIRT. NEW IN LANDS END BAG. Nice Pre Owned Condition, appears to have seen only light wear. Traditional Fit, casual or dress. SUPIMA COTTON POLO SHIRT. HUCKLEBERRY = PURPLE. NEW IN LANDS END BAG. 100% cotton, orange sherbet and white seersucker stripes. Short sleeve, logo buttons and chest pocket. Slightly curved hem. 26" across bottom hem. New Lands' End ls polo. New Lands' End long sleeve polo. sz L (42-44) - armpit to armpit is 24" and 29" length from shoulder seam to hem, and the distance from the shoulder hem to the end of sleeve is 27.5". Land's End Navy/Yellow Polo Shirt. Size Large Great condition! No stains, holes or rips Please see photos & message with any questions Thanks for looking! Lightweight cotton, Button front, collar, blue and white stripes. If I am unaware of your issue then I can't resolve it. I exhaust all efforts while resolving a conflict and I never intend to misrepresent an item or overlook a flaw. 21” Pit to Pit; 29” Top of Shoulder to Bottom. Length, shoulder to hem: 26". Armhole to armhole: 23". (FORTY FIVE T H O U S A N D) shirts sold. Our goal is to always TRY to EXCEED. Being condition is relative, and different to different people, our "interpretation" of condition is NOT given. Buy MORE NOW and Save! Excellent Used Condition (EUC). No visible stains, tears, holes, pilling, fraying, or snags. 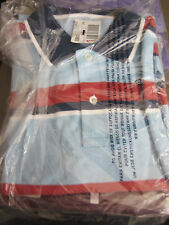 This Lands’ End Golf Shirt is in Excellent Used Condition (EUC). Nice and Clean! Warm & Comfortable. Made in Peru of a 100% Cotton. Front, Neck to Hem - 28". Sleeve, Armpit to Cuff - 22". Back, Shoulder Seam to Shoulder Seam - 19". We have observed no defects. Back, Top of Collar to Hem - 33". Green and white striped with Navy blue collar and banding on sleeves. 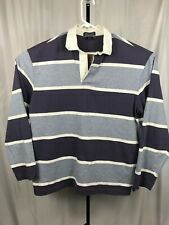 Vintage Lands’s End Authentic Rugby Shirt Retro Striped USA Made Size Large 21” Pit to Pit; 28.5” Top of Shoulder to Bottom Please refer to pictures for condition and feel free to ask any questions. Note the collar is curling and needs ironed And there is a small stain near the back right armpit (see pics). Thanks for looking! Material : Textured 100% Supima Cotton. Color : Black White. Denim collar. Pre-owned, good condition. No holes or stains. See all photos. Width (pit to pit) - 24.5 in. 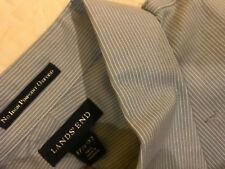 Very nice Lands' End shirt in good condition. That being said, we are human and occasionally miss things. Last Night's Shirt. Color: Yellow, White. Length (laying flat) : 29" Shoulder to Hem. Sleeve (laying flat): 23" Pit to Cuff. Size: Large. Red, white and blue stripes with solid blue collar. This pre-owned top is in great shape without any stains, tears, holes, snags or fraying on any of the hems such as the sleeves, bottom or collar, or any of the seams such as the underarms or sides. 11% Off Each Shirt When You Buy 3. 10% Off Each Shirt When You Buy 2. 12% Off Each Shirt When You Buy 4 or More. 100% Cotton. Mid shoulder to bottom 28.5 in. sleeve from underarm to cuff 20 in. Double buttons on cuffs Button front pocket Button down collar with button on back of collar. Material is soft and comfortable. Details “No-Iron Original Oxford” - Button-down collar, buttondown front, chest pocket, barrel cuff, shirttail hem. Color oxford blue & white stripe. WAIST: Lying flat, from one side of the waist to the other. Mens Lands End Preowned Lavender LongSleeve Button Down Shirt Size L 16-16 1/2 . 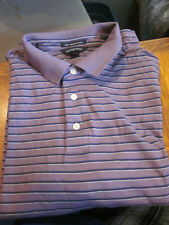 Men's Preowned Lands' End Lavender with Blue & Purple Stripes Long Sleeve Front Button Shirt Size L 16-16 1/2.